Stewart Greenhalgh was born in Sydney, Australia and holds British and Australian citizenship. Prior to joining CPG in August 2016, he was Professor of Geophysics at ETH Zürich, Switzerland for 10 years. He is also Emeritus Professor of Physics at the University of Adelaide, Australia. He has worked in academia for many years but has also been engaged as a consultant with several oil and mining companies and government agencies. He has enjoyed periods of sabbatical leave at Department of Engineering Science, Oxford University, UK; Department of Electrical Engineering, University of Minnesota, USA; Department of Physics, University of Toronto, Canada, and Institute of Geophysics, Swiss Federal Institute of Technology. He has published over 250 journal articles in various areas of experimental and theoretical geophysics. Stewart has supervised 16 post-doctoral fellows, 36 Ph.D. students, and 28 M.Sc. students. 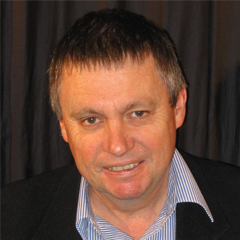 He is an Editor of Pure and Applied Geophysics and the Journal of Geophysics and Engineering. M.Sc., Theoretical Seismology, University of Sydney, 1976. B.Sc. (Hons I), Physics/Mathematics, University of Sydney, Australia, 1972. Seismic exploration; elastic wave theory; numerical seismic modelling; digital signal processing; inverse theory; full waveform inversion; laboratory seismic modelling; earthquakes; crustal geophysics; electrical and electromagnetic imaging; mining, petroleum and environmental applications of geophysics. Coscia, I., Linde, N., Greenhalgh, S.A., Vogt, T. & Green, A.G.2012. Estimating traveltimes and groundwater flow patterns using 3D time-lapse crosshole ERT imaging of electrical resistivity fluctuations induced by infiltrating river water: Geophysics 77(4), E239-E250,doi 10.1190/GEO2011-0328.1. Meles, G., Greenhalgh, S.A., Green, A.G., Maurer, H. & van der Kruk, J. 2012. GPR full waveform sensitivity and resolution analysis using an FDTD adjoint method: IEEE Transactions on Geoscience & Remote Sensing 50(5), 1881-1896. Meles, G., Greenhalgh, S., Maurer, H. & Green, A. 2013. Image appraisal of full waveform inverted GPR data. PIERS Proceedings, Stockholm, 58-64. Meles, G., Greenhalgh, S., Maurer, H. & Green, A. 2013. Some ideas yet unattempted in georadar full waveform inversion. PIERS Proceedings, Stockholm, 714-720. Ren, Z., Kalscheur, T., Greenhalgh, S. & Maurer, H. 2013. A goal-oriented adaptive finite-element approach for plane wave 3D electromagnetic modeling: Geophysical Journal International 194, 700-718. Huang, G., Bai, C.Y. & Greenhalgh, S.A. 2013. Fast and accurate global multi-phase arrival tracking: The irregular shortest path method in a 3D spherical earth model: Geophysical Journal International 194(3), 1878-1892. Greenhalgh, S.A., Liu, X. & Zhou, B. A model for determination of effective permeability from acoustic wavespeed and attenuation in a rigid two-phase porous medium: Near Surface Geophysics 12, 391-404. Huang, G.J., Bai, C.Y., Li, X. & Greenhalgh, S.A. 2014. 3-D simultaneous inversion for velocity and reflector geometry using multiple classes of arrivals in a spherical co-ordinate frame: Journal of Seismology 18(1), 123-135. Zhou, B, Mason, I & Greenhalgh, S. 2015. Seeing coal top ahead of the drill bit through Seismic-While-Drilling: Geophysical Prospecting 63, 166-182. DOI 10.1111/1365-2478.12172. Bai, C.Y., Huang, G., Li, X.W & Greenhalgh, S. 2015. 3D simultaneous traveltime inversion for velocity structure, hypocentre locations and reflector geometry using multiple classes of arrivals: Pure & Applied Geophysics, 172, 2601-2620. Mo, Y., Greenhalgh, S.A., Robertsson, J. & Karaman, H. 2015. The development and testing of a 2D laboratory seismic modelling system for heterogeneous structure investigations: Journal of Applied Geophysics 116, 224-235. Grab, M., Zurcher, B., Maurer, H. & Greenhalgh, S. 2015. Seismic velocity structure of a fossilized Icelandic geothermal system: a combined laboratory and field study: Geothermics 57, 84-94. Bagheri, M, Greenhalgh, S.A., Khojasteh, A. & Rahimian, M 2015. Dispersion of Rayleigh, Scholte, Stoneley, and Love waves in a model consisting of a liquid layer overlying a two-layer transversely isotropic solid medium: Geophysical Journal International 203, 228-245. Mildner, C., Broggini, F., Robertsson, J., van Manen, D. & Greenhalgh, S.A. 2017. Target-oriented velocity analysis using Marchenko-redatumed data: Geophysics 82(2), R75-R86.